A Yale University Art Major is saving her aborted fetuses as part of her senior art project. Aliza Shvarts says she wants to make a statement. She artificially inseminated herself “as often as possible” while periodically taking abortion drugs to induce miscarriages. Shvarts THEN TOOK THE BLOOD FROM THE MISCARRIAGES AND MADE AN “ART EXHIBIT” OUT OF IT. Her exhibition will feature video recordings of these forced miscarriages as well as preserved collections of the blood from the process. 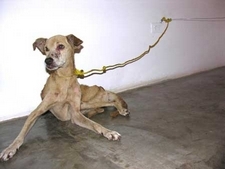 Vargas Habacuc took a starving stray dog from the streets of Costa Rica. 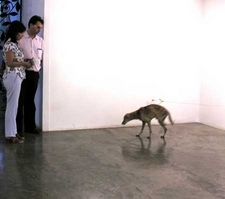 He then chained the dog up in an art gallery just out of reach of food. Although the dog couldn’t actually reach the food, it was close enough to where the dog could still smell it. 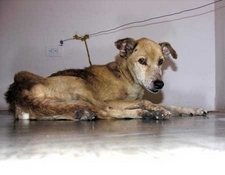 The dog (named Nativity) starved to death.